Do We Need More Talk? With the closing of the Laxpower.com web site by Active Sports Network, the lacrosse community lost another lax-oriented forum board. 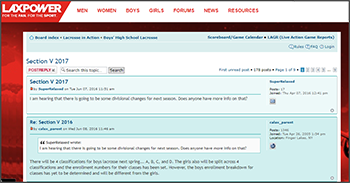 The Section Five sub-board on Laxpower was a somewhat small, but active place where a number of knowledgeable fans were able to share their ideas, their observations and their hopes for the teams in the Section. Unlike a few other boards representing other areas of the country, the comments of the Section Five board were civil, even when there were disagreements and it was a fun place to spend a few idle moments. The folks here at SportsFive have been discussing the pros and cons on opening up an area for discussion for (just) Section Five Lacrosse. It seems as though the pro-side is obvious. On the negative side is the added time for moderation (oversight of comments), the possibility for inappropriate postings, addition spam issues and (probably) the constant requests to open up more than the single board. Well, if you have read this far, you are probably competent to voice your opinion on the matter. What you think? Yes, we absolutely need a forum for section V lax talk. This is what makes upstate lax unique, how much we follow and love our lacrosse up here. Hope to see a forum up and running for this season. 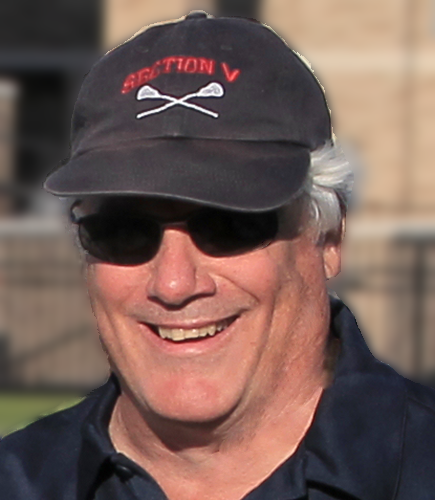 Thanks for everything You do for section V lax. Thanks for the kind words and your thoughts. I would certainly agree that it would be difficult to moderate during the season, but I bet there may be some volunteers. If so, let us know here, or use the contact us form. Before we know it the 2019 edition will be here! Yes, the forums from lax power were great. There was great talk and game updates going on in there it always gets you excited for the season and makes the season that much better going to the board and talking Section V ball. Having followed the lax forums for many years I will miss the friendly banter between fans, players and family. “Back in the day” (early 2000’s) there was limited non-commercial information available about all levels of lacrosse. Laxpower filled the void and was hugely popular- definitely a big reason for their popularity and traffic. It was used for exchanging info at a current interest level, finding contacts and info for the next level, and also scouting out-of-conference opponents via information. Some groups used it to promote their programs or players and unfortunately it sometimes moved beyond spirited debate. There was a constant need for moderation. Hate to burden the Sportsfive team with more work so I would suggest you recruit a batch of good volunteer moderators. Otherwise I think it would be a great addition to Sportsfive. I suggest starting with Youth, Scholastic, College & Pro boards for both genders focused on Section V athletes as a trial and see how it goes. Good luck and keep up the great work! Coach Wilson on Do We Need More Talk? Nigel on Do We Need More Talk? CA Lacrosse on Do We Need More Talk? For more than a half century, “Coach Wilson” has been involved as a player, coach, administrator, fan and promoter of the game of lacrosse.